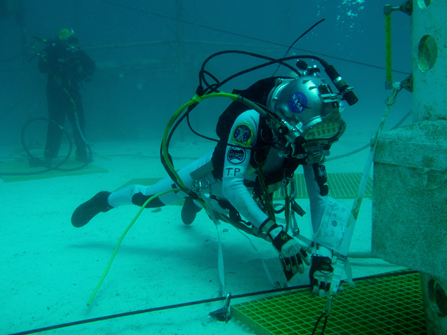 Image at right: Steve Squyres conducts an underwater spacewalk. Extra-vehicular activity. Spacewalk. Whether you say it in NASA-ese or plain English, a walk in space conjures up images of floating serenely above the Earth’s surface (or maybe above an asteroid), enjoying the freedom that only zero-gravity can afford. The reality, however, can be a little different. Nobody does a spacewalk just for fun. Yep, they’re fun, no doubt about it… ask anybody who’s done one. But they’re always done with a purpose. If you couple that sense of purpose with a solid emphasis on safety, the reality of a spacewalk is that it becomes an intricate matter of managing tools, equipment and tethers. Lots and lots and lots of tethers. 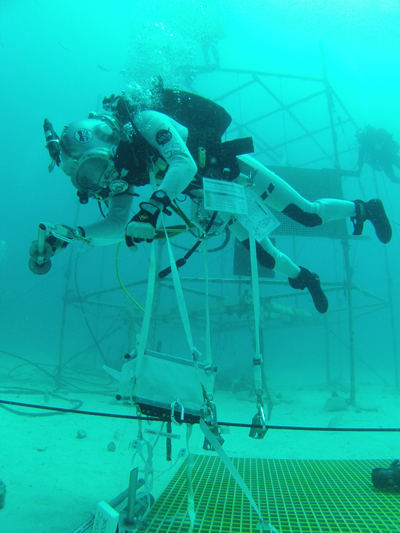 I’m the one non-astronaut on the NEEMO 16 crew, so I don’t have the months of training in EVA tricks and procedures that my fellow crewmembers have. Luckily, though, I come from a mountaineering background, where we use the same kind of equipment — nylon slings and carabiners — that the astronauts use on orbit. It’s really the same kind of problem… you need to move around, and you need to clip yourself reliably to something so that you don’t drift (space) or fall (mountains) off into nowhere. So the good news is that I sorta know what I’m doing. The bad news is that we all have to do a lot of it! We don’t go anywhere without two safety tethers holding us down to something. Any piece of equipment we have with us has to have a tether. The box that holds all the tethers has a tether. And on and on and on. You can see from the picture how it looks. Do it right, and everything works reasonably well. Do it wrong, and you’ve got spaghetti. We did it pretty well today, most of the time. But you’ve really got to keep your focus. 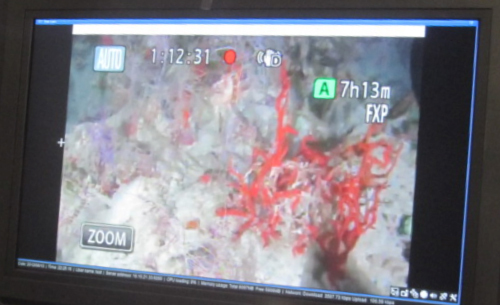 Drifting serenely above the Earth, or an asteroid, or the sea floor definitely has a certain appeal. But if you want to do it right, you also have to be pretty good at not getting tangled. 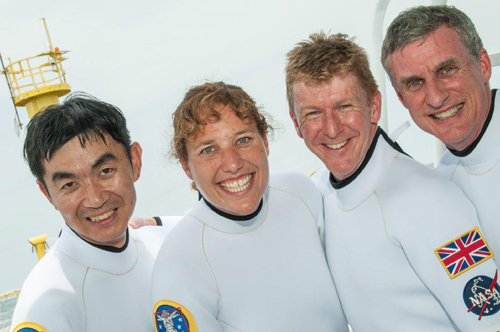 Image at right (left to right): JAXA Astronaut Kimiya Yui, NASAAstronaut (and N16 Commander) Dottie Metcalf-Lindenburger, ESA AstronautTim Peake, and Veteran Aquanaut Dr. SteveSquyres. 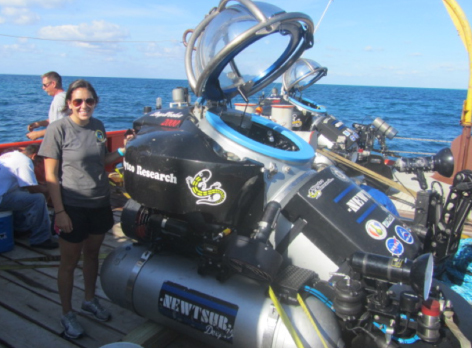 After months of training and preparation the day finally arrived…Splashdown for NASA’s NEEMO 16 mission. The crew woke early, eager to pack the few last remaining items into the ‘pots’ that our superb support crew, amongst their many other tasks, would be taking down to the Aquarius habitat ahead of our arrival. 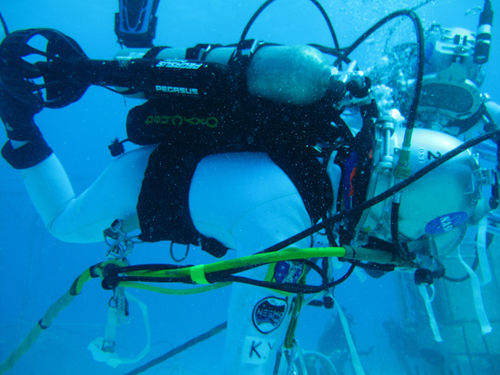 Author NASA Testing for Human Space ExplorationPosted on June 12, 2012 March 19, 2013 Categories UncategorizedTags Analogs, field test, field testing, NEEMO (NASA Extreme Environment Mission Operations)1 Comment on Splashdown! 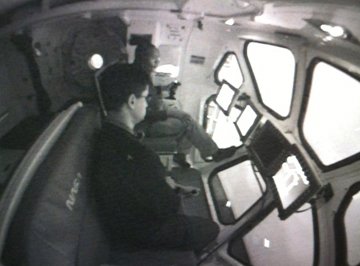 Crewmates José Hurtado and Alvin Drew conduct an MMSEV flying simulation. Test-driving a spaceship. 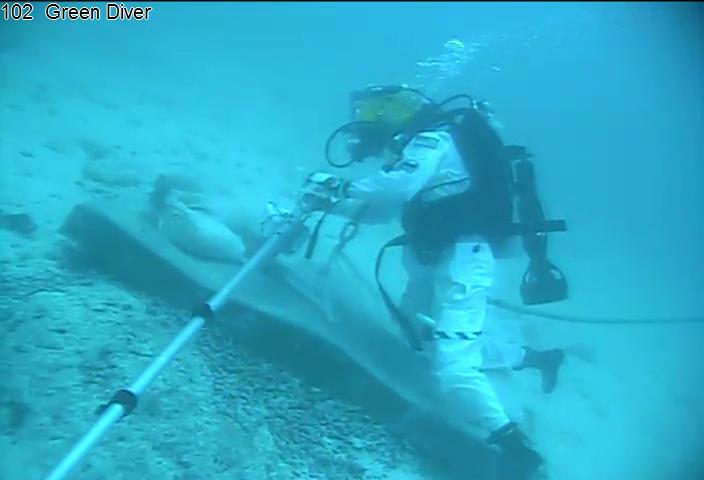 That is essentially the mission this week for me and my crewmate, astronaut Alvin Drew. As crew of the new prototype Mult-Mission Space Exploration Vehicle (MMSEV), we are test subjects in an important study of how well the MMSEV serves as a home and as a vehicle for exporing a near-Earth asteroid (NEA). 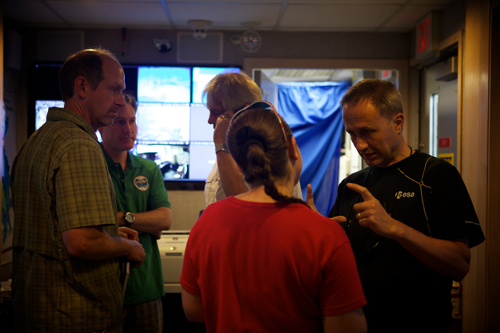 To do that we are living and working in the MMSEV for three days during a simulated mission to a NEA. During the day, we are kept busy with various tasks such as flying the vehicle, making simulated “spacewalks” or EVAs (extravehicluar activities), and other mission-oriented tasks. These are meant to test the various methods humans might use to explore a NEA. For example, today I did an EVA in the virtual reality lab. With a head-mounted display and special gloves, the lab allows me to experience the first-person view one would have in a spacesuit during a spacewalk. On this EVA, Alvin piloted the MMSEV in the simulation with me on the outside attached to a robotic arm. Our task was to visit a set of six points on the surface of the spinning asteroid using one of several possible stategies. These points could be sites for making scientific observations or for collecting samples. We chose to approach the targets at close range (a few meters) with me on the arm, at which point I would detach, acquire the target, and return to the MMSEV for a ride to the next point. Another EVA I did today was in the ARGOS facility where I practiced some of the types of tasks an astronaut might be doing at a study point on an asteroid. 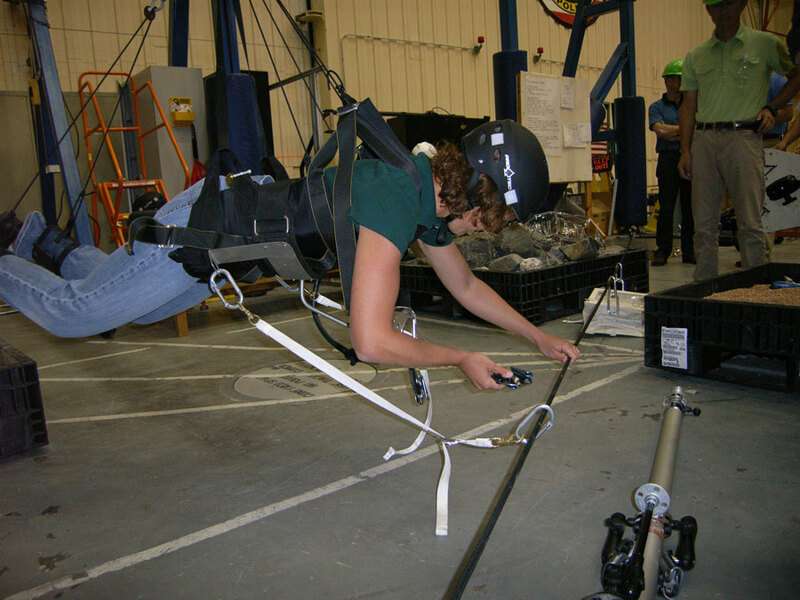 The ARGOS is a crane and winch system designed to suspend a human subject wearing a harness in such a precise manner as to offset their weight, simulating microgravity. In this simulation, I tried various concepts for collecting samples while floating about, including scooping loose material into a bag with a claw, picking up rock fragments with a gloved hand, and hammering pieces of rock off an outcrop. I also tested the use of tethers and lines vs. a rigid arm for anchoring and stability. These are just two of the various scenarios our three days of simulations is testing. The engineers, scientists, and mission planners at NASA are interested in which methods are the most efficient in terms of fuel and time (and hence consumables such as air) and which ones may be best for achieving science and mission objectives. 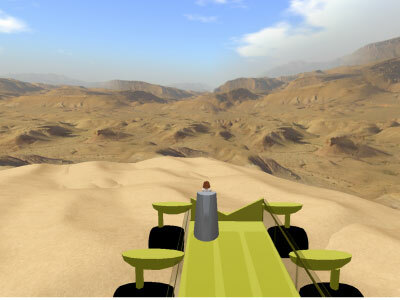 While we are conducting the mission and evaluating the performance of the vehicle for the exploration tasks, we are also paying close attention to the comfort and usability of the spacecraft as a mobile home. This includes the sleeping quarters, facilities for preparation of food, storage space, hygenie, and even the Waste Collection System (WCS) — our MMSEV toilet. Sleeping in the MMSEV is comfortable, and, with the whirring sounds of electronics and the air handling system, it sounds like the inside of an airliner. You have a little more room to spread out in here than you do on a plane, though! At night we can divide MMSSEV into two private sleep stations separated by the central aisle (and the WCS) and isloated from the cockpit and the suitports. The MMSEV can carry all the food we need on board, and it has a water dispenser/heater for drinking and rehydrating meals. Our mission this week is to live in here for three days (and so far I have few complaints! 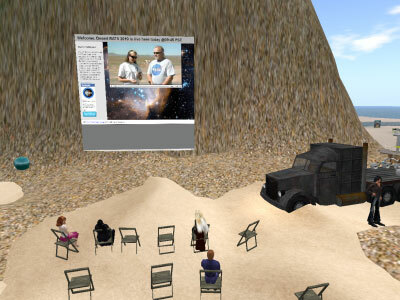 ), but the vehicle is designed to support a two-person crew on missions of two weeks or longer. 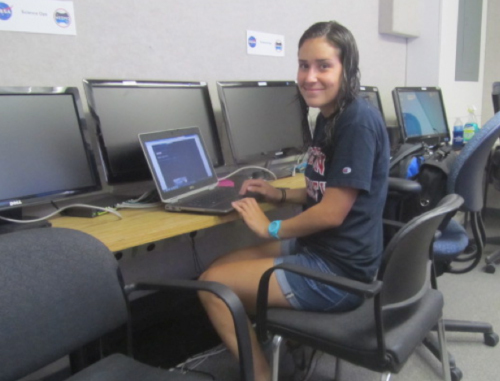 NASA will use the lessons we are learning this week to make those missions a reality.